Short video breaking down the basics of overhand serving. Portland State coach Michael Seemann discusses his terminology for the mechanics of serving - lift, shift, pop. 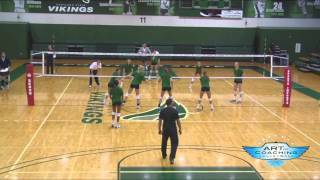 Portland State coach Michael Seemann discusses the one-handed jump-float volleyball serve. Do your players need to work on their serving accuracy? Use this drill from Mark Barnard that has them trying to knock over a pyramid of balls! John Dunning, Russ Rose, Terry Liskevych, and Mike Sealy discuss how they teach passing a volleyball at The Art of Coaching Volleyball Northern California Clinic at Stanford University. Get beginner players to interact, communicate, and problem solve as they improve their passing skills with the pretzel passing drill.